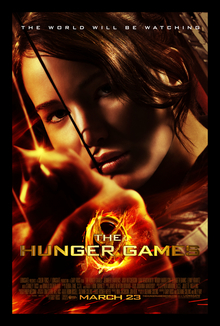 This entry was posted in Movie Review and tagged Hunger Games, Jennifer Lawrence, Katniss Everdeen, movie review, Suzanne Collins, Young-adult fiction by Book Club Babe. Bookmark the permalink. I just went to see it today! I thought overall they did a great job of adapting the book. However, I do agree that they tamed down some of the gore. It was violent, but not gory. I love how they showed the control room of the games even though that wasn’t in the book. It helped give you the idea that the Capitol controlled EVERYTHING. I wish there had been time to develop Peeta’s character more – well, both him and Katniss, but mostly him. Sometimes all the characterization that’s done in a book is hard to get across onscreen. A lot of the book is Katniss’ inner dialogue, which also doesn’t always translate into a movie, but I think they did a pretty good job of that. Yes, I also enjoyed the control room, felt it added to the experience to the Games. I also wished they could show more of Peeta, but I think that there will be more time for character development in the sequels, since most of “The Hunger Games” was devoted to world creation. I’m sure they’ll up the ante in the next film! I’m actually really glad to hear it wasn’t very gory–I’m SO bad with gore in movies. I can read the goriest things in books (I’m a huge Stephen King fan, after all) but the minute any blood shows up in a movie I’m hiding my face. I can’t even deal with people hitting each other. Don’t really know why. Oh, I’m pretty squeamish myself, but I’d at least like the option of watching the gore, even if it’s through my fingers! haha But I’m sure once you watch it, you’ll like it too! Well I’m glad you liked the movie and you weren’t too scarred by it! Might be good that you didn’t read the books then because they were pretty disturbing at times. Maybe we can see the sequel together! Ha ha okay, and yes I agree I can’t wait for the sequels! It left so many questions buzzing in my brain, I want to know what happens next and how the love story develops, (or if it ever does?). Makes me kinda want to grab a book and find out, Lol. Oh and thanks for posting spoiler alerts on your book reviews so I know not to read them if I don’t want to know the endings. I love that you do that, I wanted to formalize myself with the story line before I saw the movie and saw the SPOILER ALERT! and was like I’m glad she did that! Lol, thank you Book Club Babe! 😉 Can’t wait to read more reviews!